With two days behind us I thought we would have made better progress on the fridge. Still it remains pretty abundantly stocked. I've purchased a few minor ingredients to aid in the use of the leftovers but still the fridge seems to swell with food. My first hit tonight was the leftover grilled half eggplant. 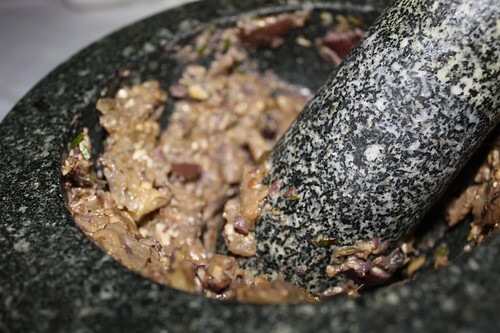 I smashed up some garlic, rosemary, pine nuts, and olives with my mortar and pestle then added the cubed eggplant to make this form of grilled caponata to go with the half loaf of bread I pulled from the freezer. For the main course I wanted to make an M.L.T. 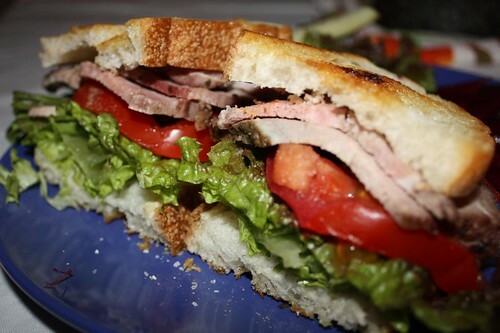 (a mutton, lettuce, and tomato sandwich). I'm not sure if this technically qualifies as I had to use lamb. I couldn't think of a place that would sell mutton that wouldn't be inconveniently located in the fifteenth century. If I do find a way back to the 1400's I'll also be sure to pick up some leeches. The ones around these days are no good for bloodletting. I think I can still get away with calling it an M.L.T. If I think back to my "Truth in Menu" discussions at culinary school lies on menus are generally only done to fool people into believing things are better than they actually are. For example: would anyone be mad if the chuck steak they ordered was actually a ribeye? For the M.L.T. 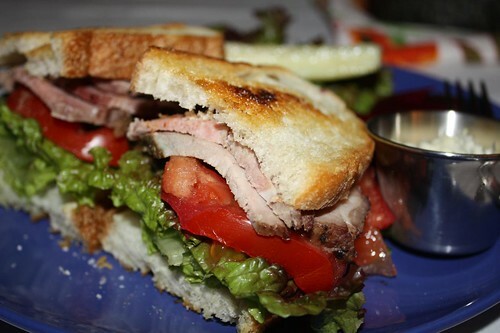 I used up slices of the leftover lamb leg from Easter, lettuce, and tomato. For Jen I browned the sliced bread with a little olive oil then rubbed the slices with garlic clove. For me I had the bread au naturale. I was going to give my bread the same treatment but the bread was so fresh and soft when I cut it I opted for this route. I knew the untoasted bread would have reminded Jen too strongly that she was having a sandwich for dinner and that would not sit well with her. I also made a garlic rosemary mayonnaise to go with the sandwiches and served it with Grillo's Pickles and Rick's Picks Phat Beets. I've found that my ability to watch TV and movies during dinner has gotten 85% worse over the last couple of years. Every show seems to have something violent or gross in it that makes me not want to eat! I think the only thing I can watch now is "How I Met Your Mother."